Director of rugby Steve Diamond says Sale were "out-enthused" by Northampton as the Sharks exited the Amlin Challenge Cup on Thursday. Sale conceded four first-half tries in their quarter-final and lost 28-14. "We'll review it and have some harsh words because we can put up with dropping the ball or giving the odd penalty away," said Diamond. "Being out-enthused is one thing that's not happened to us this year so that's what we're most disappointed about." Speaking to BBC Radio Manchester, Diamond continued: "Northampton put us in the corners and we couldn't defend the drive legally. 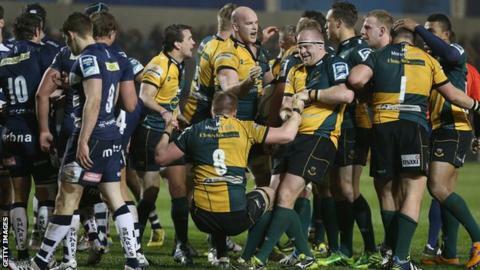 They scored two or three tries from that and it was all over at half-time to be honest." Sale will now concentrate on achieving a Premiership play-off place. The Sharks are fifth, four points behind fourth-placed Bath with four games to play.